Getting out into the great outdoors doesn’t mean you have to leave behind your electronics, worry about losing power or even sit in the dark! By harnessing sunlight you can use solar power to recharge many items around your campsite. From lights to a radio, to even providing hot water, you won’t miss out on the luxuries of life with these solar powered camping gadgets. We’ve put together a list to get you started so you can not only become a green camper but also try out some cool camping gadgets that will add some extra spark—naturally!—to your next camping excursion. This all-in-one kit covers all your solar charging/power needs while on a camping trip. The charging battery-like station features USB, 12V and universal AC outputs, allowing you to run or charge up almost any gadget you might bring along on your camping holiday. The included foldable solar panel, Nomad 20, will charge the Yeti back up to full with 17 hours of sunlight, or you can shorten this time by pairing it with another compatible panel. If you’re looking for a one-stop solution for going “off the grid” on your upcoming holidays, then this kit just might be your answer. Costs $549. This rough and tough solar phone charger is a great way to charge all your phones when you’re camping and don’t have access to power. Get back to nature by strapping this waterproof and shock resistant charger to your backpack as you hike around Byron Bay or even you head out on any fun trips to the beach or other fun must-see adventures. It takes about eight hours to charge fully, and then due to an internal battery, it can charge two or three Smartphones. It comes with five adapter tips to charge everything from iPhones and iPads to Samsung and Blackberry. Find it online with retailers for $129.50. The Scorpion is a compact, multipurpose radio with a built-in LED light. This device is powered not only through solar but also can receive power through a hand crank, which gives power to the internal battery that can charge your phone (if you have a USB cable). It can’t give a full charge, but could at least get you back to camp where you could use other options! You can listen to detailed weather reports from the National Oceanic and Atmospheric Administration station or receive other news reports. Or, if you’re in the mood for music to accompany you while on a hike, at the beach or at the campsite, hook up your iPod or other MP3 player to the Scorpion and enjoy some tunes—the naturally powered way! Costs $67.60 online, but you might be able to find it other places for less. This camping gadget sometimes retails for $50. These cases, which hold iPhone 4, 4S, 5, 5S, 6 and 6 plus (the same company sells iPad cases as well) offer some handy tools while traveling. This includes a solar panel on the rear of the case that will deliver a charge of 10 minutes of talk time to your phone for every hour it is in the sun (eventually charging both the phone and the case). 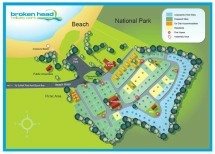 Awesome feature if you’re out for a long day on your camping holiday in Byron Bay! The LED display under the solar panel allows you to see the level of your case’s charge as well as whether you are charging via the solar panel. Beyond the handy solar battery charger capacity, this case also is dust proof, waterproof and accident proof. Good features for any camping trip! This case retails from $89.95 for iPhone 4 to $124.95 (at this time new stock is being ordered for iPhone 6 and 6 Plus). No one likes a cold shower, especially after a long day enjoying your Byron Bay camping holiday. If you are perhaps taking a few days on your holiday to camp in the true outdoors (not at a camp site, such as Broken Head Holiday Park) without easy access to a hot shower, then this cool camping gadget is right up your alley. Simply fill up the bag (available in 20L size, about 8 minutes of shower time), set it out in the sun to absorb the heat. Then hang it up when you’re ready to shower and enjoy a warm shower to wash away the day. Additional cool features include an easy on/off showerhead attachment, a pocket to store soap or shampoo and a water temperature gauge. Costs $24.50. Almost everyone carries a water bottle these days, especially when on a camping holiday. This clever camping gadget turns any water bottle (with a 51 mm internal diameter opening) into a solar lantern. All you have to do is carry around the water bottle on your backpack or set it out in the sun while you’re off taking in the sights during the day—and with its auto daylight sensor, it won’t turn on while you’re gone. When it gets dark, the four bright LED lights will illuminate the water inside and there you have it, an easy solar camping light for your campsite. The cap stores up to 15 hours of light. If you’re ready for bed, then you use the waterproof switch to turn it off and save the rest of the light for another night. Available through Outdoors Shopping on Ebay Australia. This sturdy solar flashlight provides up to 16 hours of light after less than one day in the sun. It features three settings from ambient to reading to nightlight (100 to 10%). The solar camping light is designed to withstand rugged conditions and is waterproof. Plus it has several ways to set up to deliver the light from tabletop to hanging from the ceiling (or top of the tent!). For $39, this handy light should make it easy to do a little light reading at the end of the day under the stars during your Byron Bay camping holiday. Purchase the Wakawaka Solar Lamp from the company’s website. When you’re in the great outdoors, there are times when you want to unplug. However, if you want to get directions or see if there is a storm heading your way, then technology proves very useful. But then you run into the situation that you can’t get a signal so then all your gadgets are useless. That’s when you need to pull out Earl. This camping gadget is built for the outdoors, from its GPS chipset that provides you with your exact location, direction and elevation to its VHF and UHF transceiver that allows you to connect to analog and digital radio frequencies. The tablet’s solar panel provides up to 20 hours of battery after just five hours of direct sunlight charging. The Earl tablet features many other features, including being glove friendly, so check it out and consider pre-ordering it, pricing starts at $299 when the Australian and New Zealand editions are available. Just because you’re out in nature, hanging out at your campsite or even on the beach while on holiday, doesn’t mean you want just to listen to the natural surroundings. Now it’s easy to feel still “unplugged,” but play some tunes while you’re on holiday. The Rock Out 2 Solar Rechargeable Speaker gives you 10 hours of music time on a single charge of eight hours in the sun. The lithium battery provides the power after the sun sets. You play the music through a simple Bluetooth connection, and you can even turn the speaker into a microphone so you can use it as a speakerphone. The outer shell of the speaker and solar panel are waterproof, and there is a fabric zipper pocket to store your connected gadget. Retails for $169 from Goal Zero. If you’d rather not waste money on batteries every time you go on a camping holiday, you might consider switching out your battery-charged flashlight for this Energizer Solar 4LED Rechargeable Spotlight. It will run for about 3 ½ hours after receiving five hours of direct sunlight. If you place it in a safe sunny spot at your campsite, or bring it with you to the beach, then the light will be charged ready for your use in the evening. The Energizer Solar Spotlight also is waterproof, so no need to worry if it gets wet in the rain. Order online for $49.95. If you love to take care of your teeth, but don’t want to drag along your electric toothbrush when camping, check out this solar powered toothbrush. You don’t even need to bring along the toothpaste! The ion5 uses the sun to power the toothbrush and then turn that energy into the power needed to enable the “patented antibacterial TiO2 Ion5 ionic cleaning.” Negatively charged ions come from the toothbrush into your mouth and break down the plaque and tartar as well as killing the bacteria on your teeth and gums. You just need some water and the sun and three minutes twice a day to see just how well this toothbrush works. Check out the company’s website on how to order in Australia. Dead cell phone? Take this camping gadget along with you on your next holiday, and you’ll have an on-the-go way to charge your devices. If you’re heading out to hiking in the hinterland or cycling on any of the excellent Byron Bay biking trails, pack up your stuff in this handy solar powered camping backpack. Then, while you’re out, your devices will stay charged, so you can capture all the best moments of your trip. The Lumos backpack has a 3 watt solar panel built into the bag, which will then charge the 2200 mAh battery and thus allow you to charge any USB device. Pick up this cool camping gadget for $105. If you can’t turn off work during your camping holiday, then you should at least try out this camping gadget while you’re typing away. The Logitech K760 solar powered keyboard allows you to hook up to via bluetooth and make typing up all those “necessary” emails easier. It doesn’t even need direct sunlight to power up, just normal ambient light will keep it running. Plus if you bring it along fully charged, you can even use during the evening without an issue. It matches up with your iPhone or iPad easily, and the keyboard mimics what a Mac computer keyboard looks like, so it might feel more familiar. This solar powered camping tool retails for $119.95. The last thing you need to happen when you’re on holiday is to have your car battery die. Make sure your battery stays charged and ready to start whenever you need it by hooking up this cool camping gadget, a solar powered car battery charger! Using a 1.5 watt panel, the Super Cheap Auto solar charger provides energy to your car so that you don’t have to worry about returning to your car after a long time and having it not start. You can clip it directly to your battery or plug it into the cigarette lighter plug and place the solar panel on your dash, either way works. Buy one for only $22.95. If you brought along your bike for this camping holiday or even if you plan to hire a bike for use while you’re here, it’s a good idea to have a good bike lock. This cool camping gadget takes it up a notch by being not only a solar powered device, but being a “smart” lock. It connects with your phone, which allows you to lock and unlock the device. Plus, through that same app, you can monitor your bike from up to three blocks away. That way you’ll know if someone tries to tamper with your lock. The solar panel charges automatically, and it can use not only sunlight but also indoor light, making it easy to keep the lock powered up. You can purchase the Ellipse for $199. Bring your solar camping gadgets and camp out in Bryon Bay! Known for its excellent surfing, natural surroundings and temperate weather, Byron Bay is a popular local and international tourist destination. If you favour camping to hotels, then be sure to book your Byron Bay holiday with Broken Head Holiday Park where you can get both the camping experience along with all the fun things to do in Byron Bay. The area receives an abundance of sunshine so you can bring along your solar-powered camping gadgets and be able to unplug. We look forward to seeing you soon!